It was reported today that Kenya plans to reduce its presence in the Somali port city of Kismayo in the country’s south. About two hundred Kenyan personnel will remain, but the bulk of the peacekeeping duties there will be taken over by forces from Burundi and Sierra Leon. All three countries are providers of forces to the African Union Mission in Somalia (AMISOM). The decision to withdraw the troops comes in response to complaints from Somali authorities that they were hindering attempts to assert central government control. The ability of the central government to effectively assert its authority continues to be a serious issue. Currently the top third of the country consists of semi-autonomous regions of Puntland and Somliland, which have had a complicated relationship with central government authority. In 2011, warlords in the south declared another semi-autonomous region, Jubaland, with its Kismayo as its defacto capital. The nominally supportive of the central government, the warlords in control of Jubaland are backed by Kenya and there has been the suggestion that Jubaland is effectively a buffer state against the spillover of violence from the AMISOM campaign against the Al Shabaab militant group. Semi-autonomous regions are not the only problems the United Nations-backed Somali government has been having with regards to asserting their authority. Today, the UN’s top envoy in Somalia voiced concern about rising tensions at a federal state-building conference in the city of Baidoa. The conference is intended to help the process of simply establishing a federal state in the area. Much of Somalia remains under the control of loosely aligned warlords with backing from various regional actors like Kenya and Ethiopia, and international entities, like the US Central Intelligence Agency. The US recently deployed military advisors to work on training the central government’s actual security forces. The US has also worked on training forces for deployment in support of AMISOM and has also launched targeted strikes against Al Shabaab leadership figures, including one just this week. Given all this, the UN has been pushing recently for a new and cohesive strategy to support Somali peace and security and the development of its institutions. 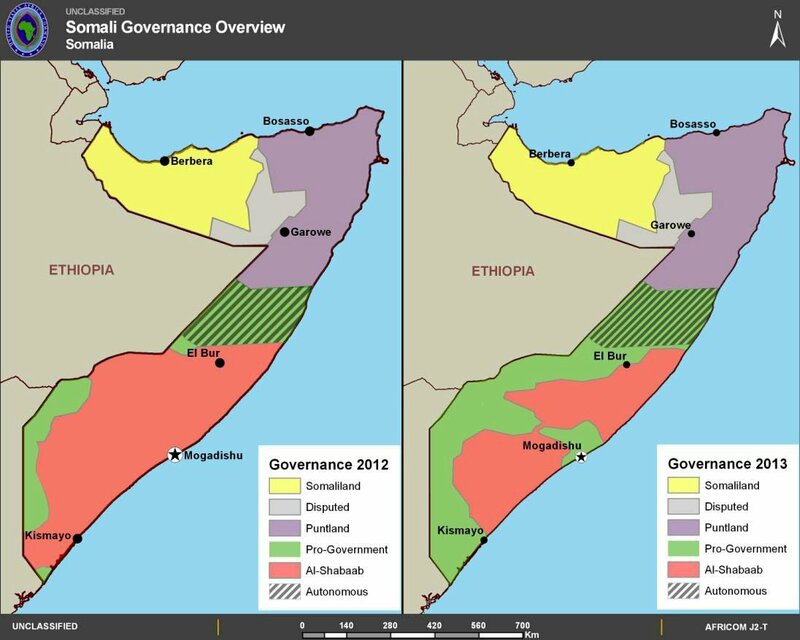 Map released by AFRICOM in its 2013 posture statement showing governance in Somalia in 2012 and 2013. This map does not show the semi-autonomous region Jubaland centered in Kismayo in the country’s south, instead lumping it in with “pro-government” territory. Still, according to the UN news piece linked to above, the priority outlined for the country remains the establishment of a “new government,” in spite of the work having been done by the various Somali administrations and the international community in the last decade. This is especially difficult at moment as the majority of the country is broken into a loose confederation, with established power structures separate from the country’s recognized government running most of the northern part of the country. The regions of Somaliland and Puntland continue to work hard to maintain their largely independent status. In the country’s south, the semi-autonomous region of Jubaland also has a complex relationship with the central government. In the meantime, Islamist militants in the country belonging to Al Shabaab, a group claiming to have connections with Al Qaeda, have continued to exploit the lack of coherent government control. There have been reports of a resurgence in the group’s numbers, which had suffered significant losses to African-led forces and US strikes in the last few years. More recently, reporting suggested, unsurprisingly, that the Al Shabaab had helped secure income by accepting payoffs from aid agencies. This would be in keeping with experiences humanitarian groups have previously had in the country. One of the possible origins of the word “technical” is said to come from UN payoffs to militants in the country to either provide security for or to otherwise ignore aid convoys in the 1990s, which were said to have been labeled as “technical expenses” in budget documents. The term “technical” is now a colloquialism for a small truck or car of non-military origin with a mounted weapon or weapons used by militants, such as the seemingly omnipresent Toyota Hilux pickup truck. A new campaign against Al Shabaab is reportedly part of the comprehensive approach suggested by Kay. This would no doubt be an important step in preparing for credible elections, currently scheduled for 2016. The United Nations Security Council today authorized a boost for the African Union’s peacekeeping force in Somalia, the AU Mission in Somalia (AMISOM), of over 4,000 troops, from 17,731 to a maximum of 22,126 uniformed personnel. The resolution, adopted unanimously, also expanded the force’s logistical package and extended its mandate until October 31st, 2014. Map released by AFRICOM in its 2013 posture statement showing governance in Somalia in 2012 and 2013. One can see the decline in areas reported to be under Al-Shabaab control. The UN Security Council made clear that the increase was temporary, in order to give AMISOM the capability to maintain basic security and respond to the evolving threat from Al-Shabaab insurgents. This was said to be part of a larger exit strategy for the international force and after eighteen to twenty-four months it was hoped that a drawdown of the force could begin. The UN Security Council also called for increased cooperation between the UN, AU, and the Federal Government of Somalia. To this end, the UN established its own Assistance Mission in Somalia (UNSOM) in June. In addition to bolstering the AMISOM force, recently Secretary-General Ban Ki-moon announced the intention to deploy a static guard unit to protect UNSOM facilities. Operations against Al-Shabaab conducted both by AMISOM, as well as other countries like the US, have steadily increased and the influence of the group has declined. The US launched a raid against the group during the night of 5-6 October and there was a reported drone strike against a senior leadership figure on October 28th. However, a significant amount of southern Somalia remains disputed and central government control is often exercised through largely independent political actors. The northern regions of the country remain largely in the hands of the autonomous governments in the Somaliland and Puntland regions. In May, nominally pro-government warlords reportedly funded by Kenya claimed to have established a new state, Jubaland, centered around the port city of Kismayo, and promptly began fighting with each other for control of it. It remains to be seen whether the Somalia authorities will be able to effectively govern in the absence of international forces.